ULINDI will be one of the first daughters to calve from MacDonald Ranches young Optimizer herdsire, MAC SEMINOLE 58S. 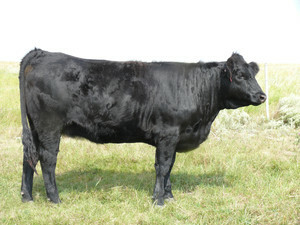 SEMINOLE is a moderate-framed, easy-fleshing and very gentle bull. His balanced carcass traits include the largest ribeye scanned in MacDonald’s 2006 calf crop, along with a %IMF ratio of 123. Her mother is a very good uddered daughter of BEV GARRETT. This fancy female is long-sided and clean made. She sells ultrasounded safe in calf to the $20,000 MAC TOPEKA 159T, the homozygous black and homozygous polled herdsire whose first calf crop is creating a stir among Salers breeders across the country. Ultrasound estimated calving date of March 3.